The U.S. stock market reported very modest gains in the first quarter of the year, and it was actually uncertain until the final trading day whether the quarterly returns would be slightly positive or negative. In the end, the Wilshire 5000 index—the broadest measure of U.S. stocks and bonds—rose 2.04% in the first three months of the year. The comparable Russell 3000 index eked out a 1.97% gain in 2014’s first quarter. Large cap stocks, represented by the Wilshire U.S. Large Cap index, gained 1.95% in the first quarter. The Russell 1000 large-cap index returned 2.05%, while the widely-quoted S&P 500 index of large company stocks gained 1.30% in the first three months of the year. The Wilshire U.S. Mid-Cap index rose 3.75%, while the Russell midcap index gained 3.53% for the quarter. Small company stocks, as measured by the Wilshire U.S. Small-Cap, gained a remarkable 2.57% for the quarter. The comparable Russell 2000 small-cap index rose 1.12% in the first three months of the year. The technology-heavy Nasdaq Composite Index lost half a percent over the same time period. Looking abroad, the broad-based EAFE index of large international companies in developed economies—Europe, the Far East and Australia—was exactly flat for the quarter, with 0% returns. The Eurozone markets reported a 1.89% gain year to date, but the Asian markets did not fare well in the most recent three months. Japan was down 9.8% in the first quarter of the year, and China’s markets have lost 7.5% of their value. Meanwhile, the less-developed nations continued their slide, with the EAFE emerging markets index down .80%. We regret that we were not astute enough to bet the farm on the quarterly performance of the troubled market in Egypt, which unexpectedly delivered a robust 21.7% return through March 31. But we also managed to avoid a high concentration in Russian stocks, which are down 17.8% so far this year, in part due to well-deserved sanctions over the invasion of Crimea, in part due to persistently low oil and gas prices. Bonds are still yielding far less than their historical averages, and the trend has been interesting. Treasury bills with 3-month and 6-month maturities are yielding less than they did at this time last year, with rates of 0.03% and 0.05% respectively. Longer-term Treasuries have seen rates drop modestly to 0.12% (1-year), 2.73% (10-year) and 3.52% (30-year). Corporate bonds have also dropped a bit; you can now buy 10-year AAA rated corporates and get a 3.13% yield, or go out 20 years and get 3.97%. This, of course, confounds the experts who have been predicting for more than five years that rates are going to rise dramatically, decimating bond portfolios. Commodities, as measured by the S&P GSCI gauge of 24 commodities, gained 2.6% over the quarter. Real estate investment trusts, a proxy of real estate investments as measured by the MSCI US REIT Index, were up 9.13% in the first quarter, despite losing ground in the month of March. The Wilshire REIT Index rose 10.13% for the quarter. When you look at the returns of 2014’s first quarter in the context of the long bull market recovery from the Great Recession, you can’t help seeing a bit of a slowdown. The markets did rise for the quarter, but it was a pretty choppy ride, and it’s hard to find any reputable commentator who is predicting another 30+% return this year. You are, instead, hearing a lot of speculation about whether the bull market is about to end, and the markets will “correct”—Wall Street speak for a 20% downturn. The evidence for a correction is that, compared to some traditional measures, stocks are at least fairly priced and they may be trading at above the prices we consider to be historical norms. The chart showing the 10-year normalized PE ratio shows that the S&P 500 is a little bit above an average figure of 16.53, but it is clearly not at the top of one of those mountains that you see in the 1929 and 2000 market tops. Others worry that certain drivers of U.S. economic growth may be slowing down, even though the most recent reports show continuing gains in employment and growth in factory orders. Housing starts and sales have come down modestly from this time last year, and wages are not rising. On the other side, you are seldom near a market top when many people are speculating that you are. Market tops seem to have the magical ability to silence doubters precisely when they should be most doubtful, and investors are seldom cautious near the peaks. Moreover, the fact that small and midcap equities outgained large caps suggests the companies that depend on the U.S. economy are strengthening a bit, while the least strong U.S. firms are those which are dependent on profits overseas. This leads to another type of speculation. 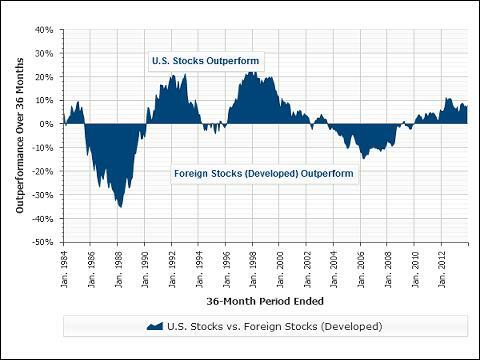 Some analysts wonder if foreign stocks will provide higher returns than the U.S. markets over the next cycle. As you can see from the chart, where the mountains above the line are time periods when U.S. stocks outgained their foreign counterparts, there is an ongoing see-saw, where American returns beat the rest of the world, and then the rest of the world returns the favor for sustained periods of time. The U.S. has been winning lately, and is clearly winning so far this year, but how long will that last? The problem with all of this analysis is that it is really speculation about the unknowable future. When markets get slightly overvalued, history tells us that they can get much more expensive as markets climb rapidly toward frothy tops, and those who trimmed back on their stock exposure are kicking themselves for missing those extra returns. History also tells us that corrections and bear markets never announce themselves in advance. 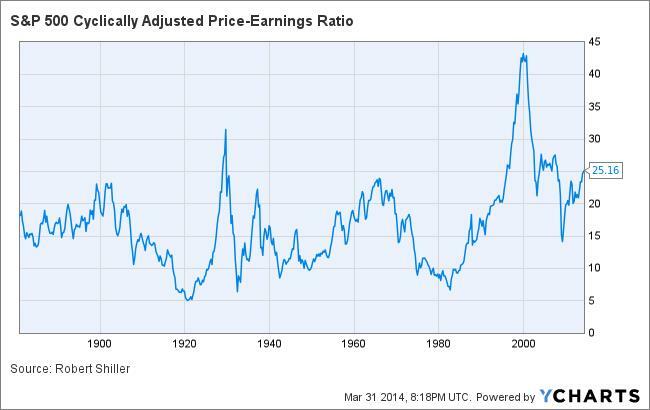 If stocks go on sale in the next quarter or two, it will give us a chance to buy more on the cheap. If they go up, we will report the good news and experience a renewed sense of caution while less seasoned investors grow more enthusiastic.